Evanston Fire Department and University Police respond at the scene of the multiple vehicle accident. The accident occurred around 9:30 p.m. at Colfax Street and Sherman Avenue. Two people were transported to the hospital with minor injuries after a multi-vehicle accident at the intersection of Colfax Street and Sherman Avenue. 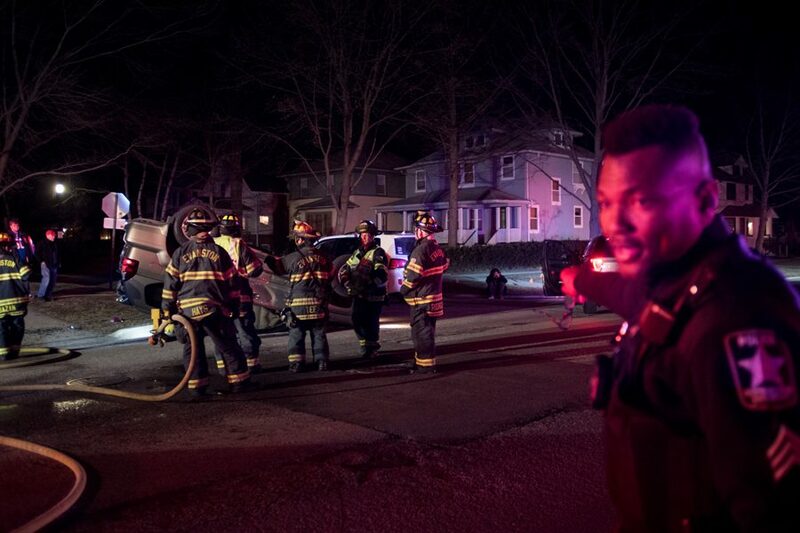 Evanston Fire Department tweeted at 9:30 p.m. about a multiple vehicle accident at the intersection, originally stating that there were no injuries. Two vehicles collided at the intersection, causing a vehicle to flip over and deploy its airbags. University Police were originally on the scene of the accident. Resident and Kellogg School of Management student Taylor Jensen heard the accident and came out to the intersection. There, he said he saw two passengers in the front seat of a vehicle that had flipped over.“When the police got the doors open finally, [the two passengers] were able to walk away to the ambulance,” said Jensen. Evanston Fire Department tweeted at 9:48 p.m. stating that two people were transported to the hospital with minor injuries from the accident. The stretch of Sherman Avenue between Central and Dempster streets is part of one of the designated truck routes in Evanston, with this stretch serving Northwestern University and Evanston Hospital. Ald. Judy Fiske (1st) lives nearby where the accident occurred and said the intersection on the route does not meet the traffic requirements to install a stop sign for north- and southbound traffic on Sherman Avenue.